You’re steps from having a professional tear sheet to distribute to investors. Complete the order form and payment to the right to get started. You’ll next be directed to a form to provide the information needed to create your tear sheet. We’ll create an initial draft for your review based on the information you provided for your review. Based on your feedback we’ll make any additional updates and send you back your final tear sheet and login for you to access your tear sheet online. 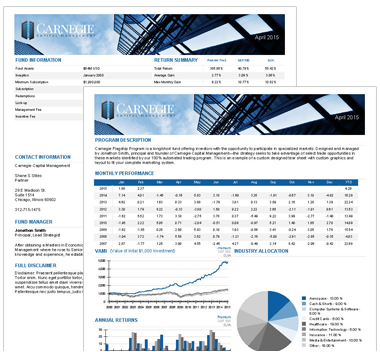 You’re ready to update your data monthly and send a tear sheet to your investors as soon as you have your monthly performance ready! Complete the form to get your tear sheet started! Still have questions? Contact us about the tear sheet.